The author was John R. Bolton, a former State Department official and, for a brief period, US ambassador to the United Nations, under the administration of George W. Bush. He became an influential figure in the administration after serving as a lawyer in the Bush campaign’s successful operation to steal the 2000 election by stopping the vote count in Florida. Bolton, it must be said, has been calling for an immediate military attack on Iran’s nuclear facilities—by either Israel or the US, or both—for at least the last seven years. On each occasion, he has warned darkly that unless his prescription for intensive bombing followed by “regime change” was adopted within days, the world would face the threat of an Iranian nuclear attack. Thursday’s column was no different. “President Obama’s approach on Iran has brought a bad situation to the brink of catastrophe,” Bolton writes. He is referring to the attempt by Washington, together with the other member nations of the UN Security Council plus Germany, to negotiate restrictions on a nuclear program that Iran insists is strictly for civilian purposes in return for easing punishing economic sanctions. Bolton, who has made an entire career of suppressing “inconvenient truths,” allows that he would prefer an all-out US bombing campaign, but would accept a US-backed attack by Israel. What is involved here is an open appeal for the launching of a war of criminal aggression and incitement of mass murder. The unbridled militarism expressed in Bolton’s column would not be out of place in the writings of Hitler’s foreign minister, Joachim von Ribbentrop, the first to hang at Nuremberg after his conviction on charges of crimes against peace, war crimes and crimes against humanity for his role in organizing the Nazi regime’s wars of aggression. The question arises, why has he been given a forum in the editorial pages of the New York Times, the supposed newspaper of record and erstwhile voice of American liberalism? The obvious answer is that any differences the Times editorial board—or for that matter the Obama administration—have with Bolton over Iran are of an entirely tactical character. All of them stand by the principle that US imperialism has the unique right to carry out unprovoked “preemptive” war anywhere on the planet where it perceives a potential challenge to its interests. Not so long ago, Bolton, who personifies this arrogant and criminal policy, and the Times were on the same page politically and on essentially the very same lines he presents in his latest column on Iran. 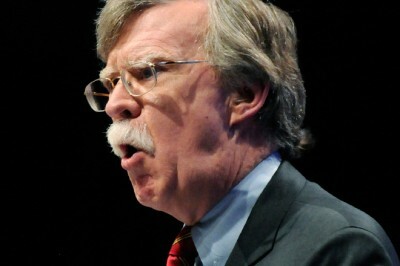 In 2002, Bolton was Undersecretary of State for Arms Control and International Security and a point man in the Bush administration’s campaign to prepare a war of aggression against Iraq based upon the lies that Saddam Hussein was developing “weapons of mass destruction” and preparing to hand them over to Al Qaeda. Bolton, described by one of his former colleagues at the State Department as “the quintessential kiss up, kick down kind of guy,” had been an advocate of aggression against Iraq at least since 1998, when he joined other right-wingers in signing an “Open letter to the president” demanding such a war. In the run-up to war, he played a central role in manufacturing phony evidence of the existence of Iraqi WMD. This included the promotion of the crude forgeries indicating that Iraq was seeking to procure yellowcake (concentrated uranium) from Niger. During this same period, the Times provided invaluable assistance to this propaganda campaign. Its senior correspondent Judith Miller was working in alliance with administration officials and right-wing think tanks to confirm and embellish upon the lies about WMD. Thomas Friedman, the paper’s chief foreign affairs columnist, was churning out column after column justifying what he readily acknowledged was a “war of choice” against Iraq, justifying it in the name of democracy, human rights and oil. As the reputed newspaper “of record,” the Times set the tone for the rest of the corporate media, which together worked to overcome popular opposition to a war in the Middle East. The results are well known. The war claimed the lives of over a million Iraqis, devastated an entire society and threw the whole region into chaos. In the process, some 4,500 US troops lost their lives, tens of thousands more were maimed and wounded and some $2 trillion was expended. A dozen years later, the Obama administration has launched a new war in Iraq, supposedly to halt the advance of ISIS, a force that it effectively backed in the war for regime change in Syria. No one has ever been held accountable for these war crimes; not Bush, Cheney, Rumsfeld, Bolton and others who conspired to drag the American people into a war of aggression based upon lies. And not the editors of the Times who produced the propaganda that facilitated their conspiracy. In publishing Bolton’s column, the Times is making sure that it burns no bridges to the most right-wing and sociopathic layers of the American ruling establishment. While it may differ with them now over an imminent bombing of Iran, future US wars—including against Russia or China, where the propaganda mills of the Times are grinding once again—will undoubtedly bring them back into sync.